When is Turtle Season in Parismina? The Leatherback Sea Turtles nest from February to July, peaking from mid April to mid May. The Green Turtle's nesting season runs from July to October with the largest numbers arriving in august. The hawksbill turtles nest from march to October. It is possible to see individual turtles at any time of the year. Guides are available year round. What type of Sea Turtles come to Parismina? At least four types of sea turtle nest on the beaches of Parismina including green, leatherback, hawksbill, and loggerhead sea turtles. The turtle season is longer in Parismina than in neighboring Tortuguero because of the large number of leatherback sea turtles that nest in the black sand dunes of the beaches near Parismina. Click here to see a survey of sea turtle anatomy by Jeanette Wyneken, Ph.D. The leatherback turtle (Dermochelys coriacea) is the most critically endangered of the marine tortoises and is also the largest. Leatherbacks can exceed 540 kg (1180 lbs). Leatherback turtles are not generally killed by poachers for their meat, which is described as having a disagreeable texture and flavor. Unfortunately, leatherback turtle eggs are among the most desirable turtle eggs, mistakenly believed by many to have potent aphrodisiac power. Green turtles (Chelonia mydas) are not actually green but take their name from the color of their body fat. These turtles are hunted for both their eggs and their meat, which is widely held to be the most delicious of all the sea turtle species. The beaches between Parismina and Tortuguero are believed to be the most important Atlantic nesting grounds for these turtles. are often for their shells which are the source of tortoiseshell, a translucent brownish-yellow material once prized for making hair combs and eyeglass frames. This material is now ILLEGAL and should be avoided to show your support for these endangered turtles. The hawksbill turtle is also critically endangered. Loggerhead turtles (Caretta caretta) come to the beaches of Parismina, but in smaller numbers than the Green, Leatherback and Hawksbill turtles. Loggerhead turtles are endangered. Copyright � 2003-2009 [Parismina.com]. All rights reserved. Regular beach patrol for the 2009 season is starting up again March 1st, and the turtle association is working with the CCC and the Coast Guard to figure out how to patrol the beach between the Parismina river mouth north to Jalova. 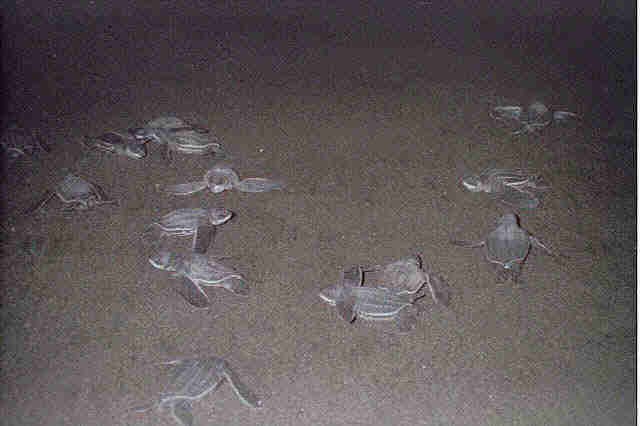 The first Leatherbacks were reported in the village the week of 2/16/09 and we are looking forward to a great season! A small but dedicated group has been working to protect the sea turtles of Parismina since 1991 - learn about the history of the project here. To arrange your volunteer/homestay in Parismina, contact the tourist kiosk in Parismina directly at (506) 2710-7703 MWF from 2-4 Costa Rican time (US Central Time with no daylight savings). Click here for more information. For volunteer information, please contact the turtle association directly at parisminaturtles@gmail.com. You can also support the turtle project by making a small donation (even $5 goes a long way in Parismina!). You are also welcome to email us with any questions. The Parismina Turtle Commission operates along the Caribbean beach of Parismina, Costa Rica. Leatherback, Green, Hawksbill and Loggerhead turtles come ashore to lay their eggs. In April of 2001, the Costa Rican Coast Guard and volunteers from Parismina started a turtle hatchery to combat the effects of widespread poaching. During nesting season, they patrol the beaches at night trying to stop the poachers while gathering eggs from the nests and relocating them to the hatchery. Homestays are definitely the best way to experience Parismina. Turtle volunteers are placed with well screened host families. Volunteers are guaranteed a private secure room and meals during their stay in the village. Many groups have contributed to the turtle conservation efforts by donating items such as walkie-talkies to allow beach patrollers to communicate. What is Causing Sea Turtle Extinction? Commercial fishing, particularly 'long line' fishing used to catch ocean fish such as swordfish and tuna, is believed to be the leading cause of the decline in global sea turtle population. This, combined with the development of sea turtle nesting grounds has led to staggering population decreases and numerous local extinctions. 'Debris ingestion' is another leading cause of death, particularly among leatherback turtles. Turtles mistake plastic bags or other garbage for desirable food items (such as jellyfish- a leatherback staple). Eating plastic leads to intestinal blockage and possible death. The days of the turtle poachers are over! What are TED's (Turtle Excluder Devices)? Turtle excluder devices are devices used by commercial shrimp fisheries to reduce the 'take' of sea turtles. These are basically a grid of metal bars with an opening at the top or bottom which is fitted into the neck of a shrimp trawl These were implemented by the National Marine Fisheries Service (NMFS) and are required for shrimp boats in the Atlantic. NMFS is working closely with international partners such as Mexico. Unfortunately, the escape hatch on most of the NMFS approved TEDs are too small to allow a full size leatherback turtle through. For centuries, the inhabitants of the Caribbean coast of Central America relied on meat from Sea Turtles to feed their families. 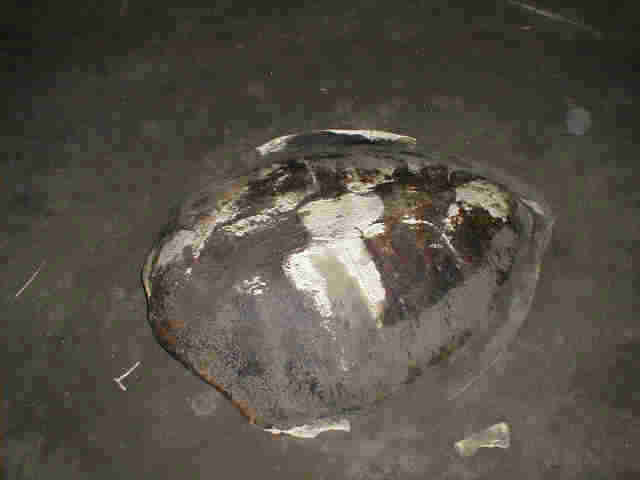 Until this generation, the word meat meant turtle meat in the village of Parismina. Although the bounty of the sea provided for many generations, outsiders began streaming in to poach, taking the meat and eggs to sell illegally in urban markets. These outsiders contribute little to the economy of costal villages and make the beaches less safe for everyone. The best way to save the turtles of Parismina is to make the turtles more valuable alive than as dinner. Many locals have taken the time to get certified as tourist guides. Help save the turtles of Parismina by hiring a guide and visiting the Turtle Hatchery. Take the time to see this quaint village- well off the beaten tourist track. Inquires may be sent to webmaster@parismina.com.